Jennifer Ford has been a lifelong resident of Bullitt County. 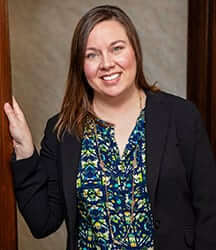 She has worked in various legal roles since graduating high school and has been the Office Manager at Molly Burke Law Office, PLLC since 2016. Jennifer and her husband have three wonderful kids who attend Bullitt County Public Schools. Jennifer is currently enrolled in the Criminal Justice program at the University of Louisville and is on track to graduate in 2019.